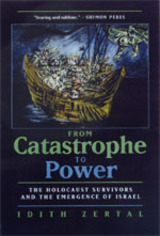 In a book certain to generate controversy and debate, Idith Zertal boldly interprets a much revered chapter in contemporary Jewish and Zionist history: the clandestine immigration to Palestine of Jewish refugees, most of them Holocaust survivors, that was organized by Palestinian Zionists just after World War II. Events that captured the attention of the world, such as the Exodus affair in the summer 1947, are seen here in a strikingly new light. At the center of Zertal's book is the Mossad, a small, unorthodox Zionist organization whose mission beginning in 1938 was to bring Jews to Palestine in order to subvert the British quotas on Jewish immigration. From Catastrophe to Power scrutinizes the Mossad's mode of operation, its ideology and politics, its structure and history, and its collective human profile as never before. Zertal's moving story sweeps across four continents and encompasses a range of political cultures and international forces. But underneath this story another darker and more complex plot unfolds: the special encounter between the Zionist revolutionary collective and the mass of Jewish remnant after the Holocaust. According to Zertal, this psychologically painful yet politically powerful encounter was the Zionists' most effective weapon in their struggle for a sovereign Jewish state. Drawing on primary archival documents and new readings of canonical texts of the period, she analyzes this encounter from all angles—political, social, cultural, and psychological. The outcome is a gripping and troubling human story of a crucial period in Jewish and Israeli history, one that also provides a key to understanding the fundamental tensions between Israel and the Jewish communities and Israel and the world today. Idith Zertal, an Israeli historian and essayist, is the author of several books and many articles on Jewish, Zionist, and Israeli history. She teaches history and cultural studies at The Hebrew University, Jerusalem, and at The Center for Interdisciplinary Studies, Herzliya. She has also been a visiting professor and senior research fellow in the United States, Europe, and Israel.